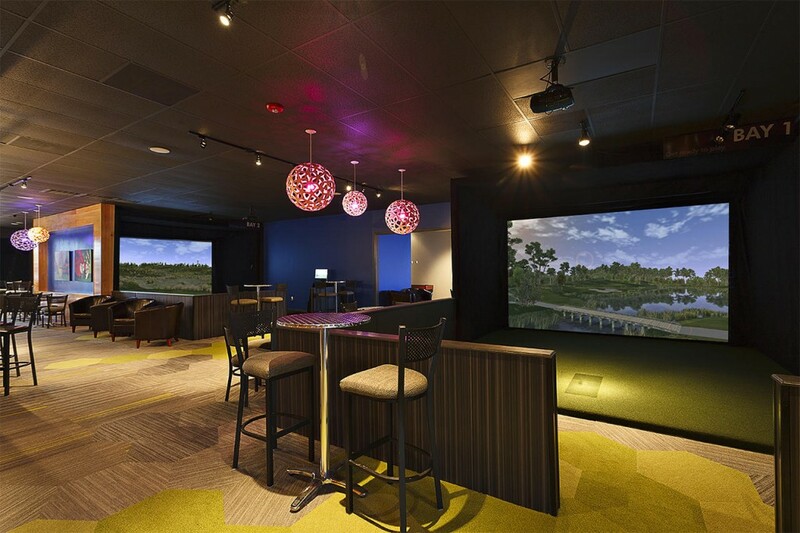 Golf Technologies are experts in the design, build and supply of golf simulators. We combine the accuracy of the Flightscope Doppler Radar and the incredible graphics of TruGolf E6 Golf simulation software on some of the best golf courses on the planet. We now have multiple options for all types of uses and budgets. We are excited about our range of bays as we are continually evolving them to be both functional and aesthetically pleasing. We offer numerous options around colours and sizes, for these reasons alone it is best to contact us and work through which selection best fits your needs. The newly introduced semi portable bay can be shipped nationwide and assembled using just a rivet gun. Typically a bay would measure 4.5 metres in width and 3 metres in height. Room length should be around 6 metres. These measurements can be altered to suit your environment but going smaller could mean some form of compromise. We base our golf simulators around the Flightscope Doppler radar to measure club motion and ball flight. Flightscope is recognised as the benchmark for accuracy and analysis within the golfing industry. There are three different models of Flightscope to choose from that allows you to have a simulator that truly meets your needs and your budget. The information gathered by the Flightscope is integrated into TruGolf E6 simulation software which plots the shot onto the courses or contests supplied as part of the E6 Software. Seamlessly integrating with your FlightScope unit, the TruGolf E6 software offers state of the art graphics to add a whole new dimension to your FlightScope. There are packages to suit all pockets, with an impressive library of courses available, including Pebble Beach and St. Andrews! Golf courses have long been recognized as some of the most beautiful places on earth. Each E6 course has been carefully crafted to accurately replicate the actual course down to the finest detail. Not only do they have the same look and feel of the real course, but they play like the real course as well. This system offers one of the largest and most prestigious course libraries in the industry, with over 80 courses currently available. According to Golf Digest, 18 E6 courses are ranked in the “Top 100 Courses in America”, 23 are ranked in the “Top 100 Courses in the World”, and 32 hold televised events. The Element 6 (E6) system uses digital technology to capture all features of each course. Then, using exclusive world modeling tools, it is possible to achieve pinpoint accuracy and an incredible degree of detail. The E6 is packed full of state-of-the-art features such as Time of Day – players can determine the time of day they want to tee off. Using real world modeling, changing colors, reflections and shadowing are as real as if you were outdoors. Start your round early in the morning and watch the shadows fade and the sun cross the sky; as you play your round. Another feature is the unmatched Graphic Animations – the E6 was designed to make you feel as if you were playing outdoors. Grass, trees and the flag react to changing wind conditions. Listen to the waves crash along the shore, watch and hear the rain fall, there are even birds and crickets chirping in the background as you play your round. – 36 Modes of Play Scoring Styles – Stroke Play, Scramble, Skins, etc. – Integrated Swing Analysis – E6GOLF includes our sleek swing analysis, informing you at–a-glance of essential data related to your swing.